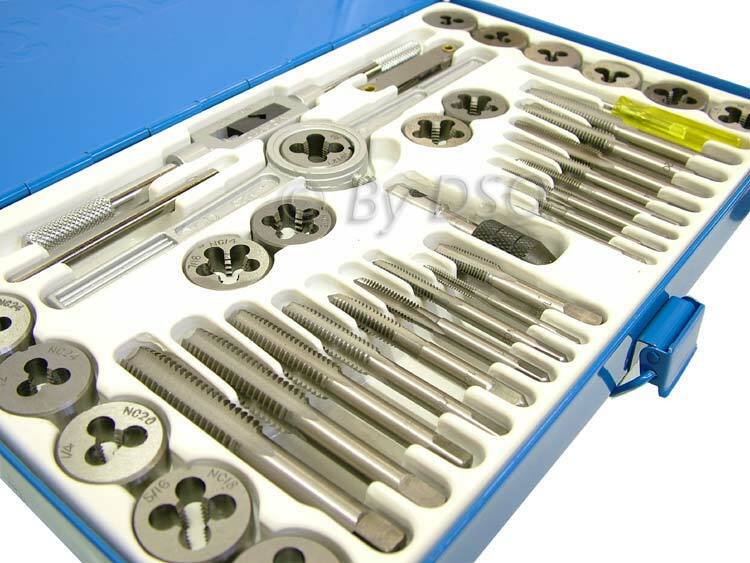 This 40 piece tap and die set is made from high quality alloy steel and comes in a durable embossed metal storage case. It is ideal for creating and repairing popular SAE size threads and can be used for automotive and general mechanical workshop purposes. The components are etched with UNF and UNC sizes. The tap wrench has screw adjustment and is suitable for M3 - M12. The die handle has an internal diameter of 25mm (1") with thumbscrew to hold components securely in place. Supplied with tap wrench, die handle, 17 taps and 17 dies, T-Bar Handle, Flat head screwdriver and feeler gauge. All neatly presented in a tough metal box carry case for convenient storage. This item is brand new however the Case is Damaged and has rust on the case the tools inside are in new condition so it is a great deal, not to be repeated. There is no returns policy on this item. Whilst extra care is taken during the packaging process, we cannot accept liability for damage that may be caused during transit. All products carrying this disclaimer are pre-checked and where necessary, added protection is introduced prior to packing and despatch. There is no warranty offered in these items. Get it before it's gone!